On january 5, the Madras High Court stayed the expansion plans of Sterlite Industries for its copper smelter plant in Thoothukudi. The court stayed the project on a petition challenging the environmental clearance to the plant by the Union environment ministry, saying public hearings were not held. “Public hearings are exempted for industries within notified industrial areas. 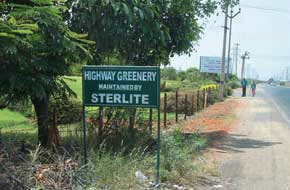 Sterlite says the expansion is within the State Industries Promotion Corporation of Tamil Nadu industrial estate but they have bought 127 acres of private land. This is outside the industrial estate,” said N Pushparayan of non-profit East Coast Research and Development in Tuticorin who filed the petition. The ministry clearance also okayed a 10 million litres-a-day desalination plant outside the industrial estate in a coastal regulation zone. The public hearing for this has been waived. The clearance does not mention a power plant but in October 2009 Sterlite issued a press release announcing the expansion and a 160 MW captive power plant. The petition also said the state pollution control board’s consent to the project in March 2009 is invalid as it was based on a previous clearance from the ministry. The company, a subsidiary of Vedanta, gave an undertaking that it will not expand till the case is resolved.